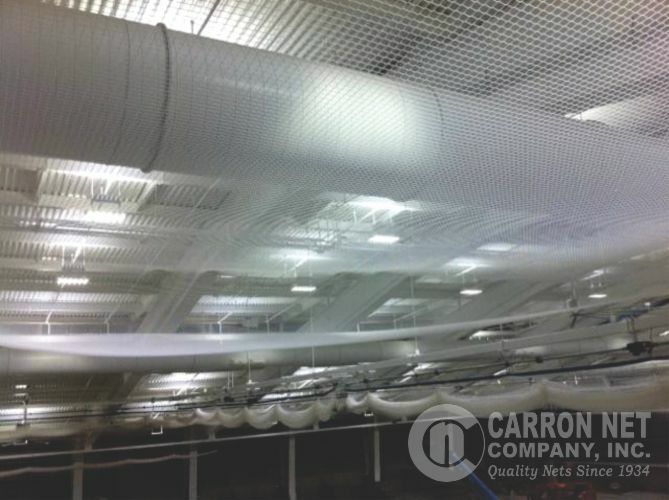 Major colleges and universities use Carron nets in their fieldhouses. The nets can be used to form enclosures large enough for an entire baseball or softball team to practice in at one time. Operable barrier netting allows for multiple field configurations and can separate turf and floor surfaces from perimeter running tracks. Ceiling nets protect lights and HVAC/ceiling structure from damage. Fieldhouse nets are generally made of 100% nylon mesh or a combination of netting and vinyl. Netting for archery, golf, lacrosse, football, softball, or baseball, and throwing cages can be incorporated into a system to optimize use of your space. Lift lines are typically added to these nets allowing them to be raised and lowered at the touch of a switch. Contact the factory for pricing and details including referrals for specification and design of operable netting systems. ALL CARRON FIELD HOUSE NETS ARE MADE TO ORDER. Request a quote or call for more information.